Dragon Boat Festivals – From Tonbridge to Taipei! Tonbridge may not be the most exotic of locations, but this is where Worldwideinsure.com’s Søren V Nissen and his team, the Bidborough Dragons, recently placed 3rd in the annual Tonbridge Dragon Boat Race. The fun and frolics of the event featured in the video below inspired us to find out where adventurous travellers can go to experience the excitement of Dragon Boat Festivals around the world! This race was just one in a Dragonboat Weekend Challenge (September 13 & 14) for Bidborough Primary School PTA raising money for Demelza House Children’s Hospice. It is easy to spot Søren and Co. because they always wear their children’s yellow school caps. It’s a tradition they are reluctant to break! It’s not too late to donate! Please visit justgiving.com/bidboroughdragons2014 to help a good cause! 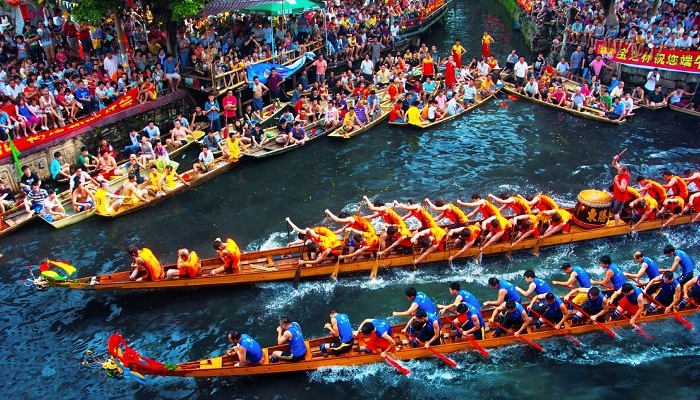 Dragon Boat Festivals – where to go! HK is the oldest host of International Dragon Boat Festival Races, with HKIR 1976 being credited as the beginning of a modern era in Dragon Boat racing. As such, it should be the destination of a lifetime for anyone who has a passion for the sport. 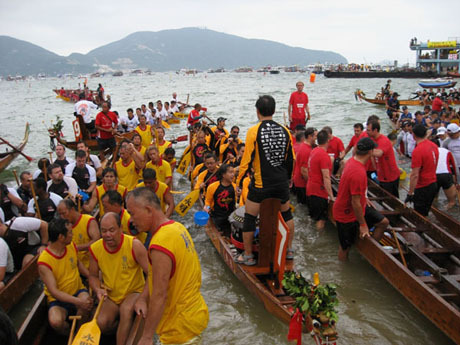 Stanley Dragon Boat Association runs an array of events on throughout the summer and into the autumn at Stanley Main Beach in Hong Kong. Alternatively, revelers can head to Tai Wan To beach on Lamma Island for a one day Dragon Boat extravaganza! The next Lamma 500 International Dragon Boat Festival will be held on Sunday 26th April 2015. Back in 1945, Vancouver was chosen to be the first city to hold a Dragon Boat Race outside Asia, but due to some political problems, the first race wasn’t held until 1986. It’s position as the North American gateway to Asia made it the ideal location to spread the joys of Dragon Racing, and it is still a great place to go to take part in festivities! 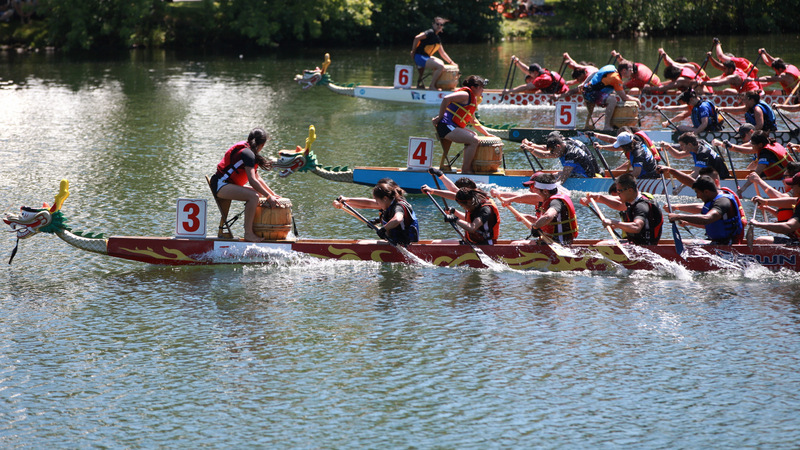 Toronto International Dragon Boat Race Festival is just one of many events held in Canada throughout the summer. This year’s event at Toronto Centre Island saw over 5,000 athletes take part, and next year’s (the 27th as Tim Horton’s TIDDBRF) will no doubt be just as impressive. Although the season for racing is coming to a close, should you find yourself in Cayuga on 04th October 2014, you’ll get a chance to see the Lively Dragon Cayuga to Dunnville, Grand River Run. Sunny Taipei is an idyllic location for Dragon Boat Festival celebrations, marked by a public holiday by the name of Duanwu Festival. Typical activities include preparing and eating zongzi (aka sticky rice dumplings), drinking realgar wine (a rather worrying mix of wine and arsenic-laden mineral! ), and of course racing Dragon Boats. Duanwu Festival is held on the 5th day of the 5th month of the traditional lunar calendar, which is why the date for Dragon Boat celebrations worldwide varies throughout the summer. In 2015 it will be held on June 20th, and the following year it will fall on June 09th. Wherever in the world you fancy taking part in celebrations or races, we are sure you’ll have plenty of fun. Don’t forget we offer travel insurance to suit spectators and partakers! Get a quick quote online or call us on 01892 628530. This entry was posted in Fun, The places we've been, Travel Advice, Uncategorized on September 18, 2014 by worldwideinsure.